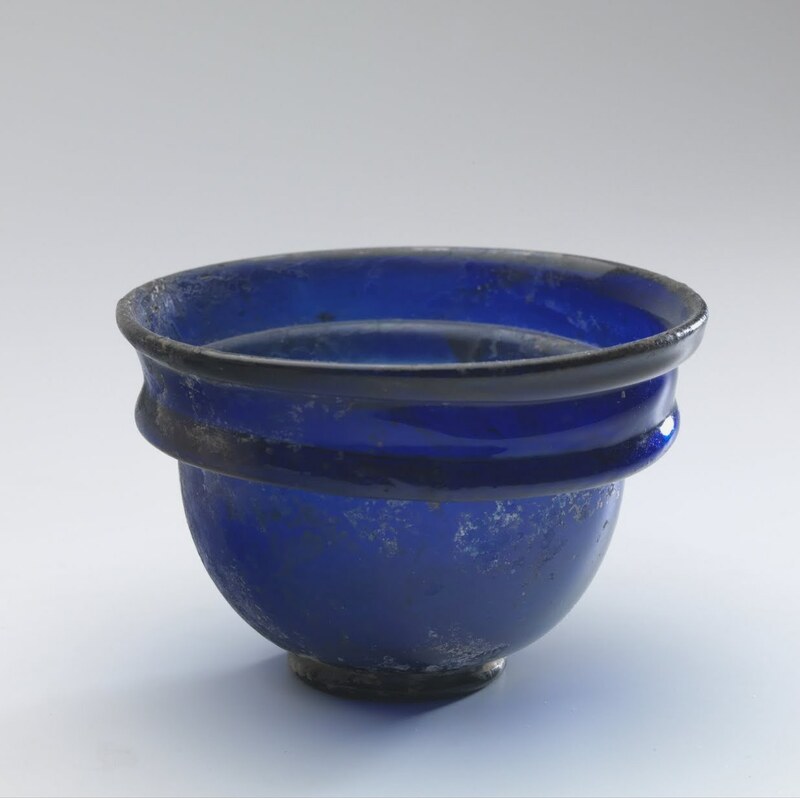 Romans often drank a mixture of vinegar and water and had a special container for this called an acetabulum. This is from the Latin acetum (vinegar) and abulum the suffix denoting a small vessel. Today the word is used only as a medical term to describe the cup-like shape in your hip that the thigh bone sits in. Usually made of pottery, some in the first Century, as in this example were made of glass and often found in Italian graves. Below are three examples. 2nd. half 1st. to 3.rd century A.D. Isings form 36 H: 8.05 cm W: 7.21 D-Rim: 7.89 cm D-Foot: 3.3 cm. Technique: Free blown; rounded rim, standing ring applied. 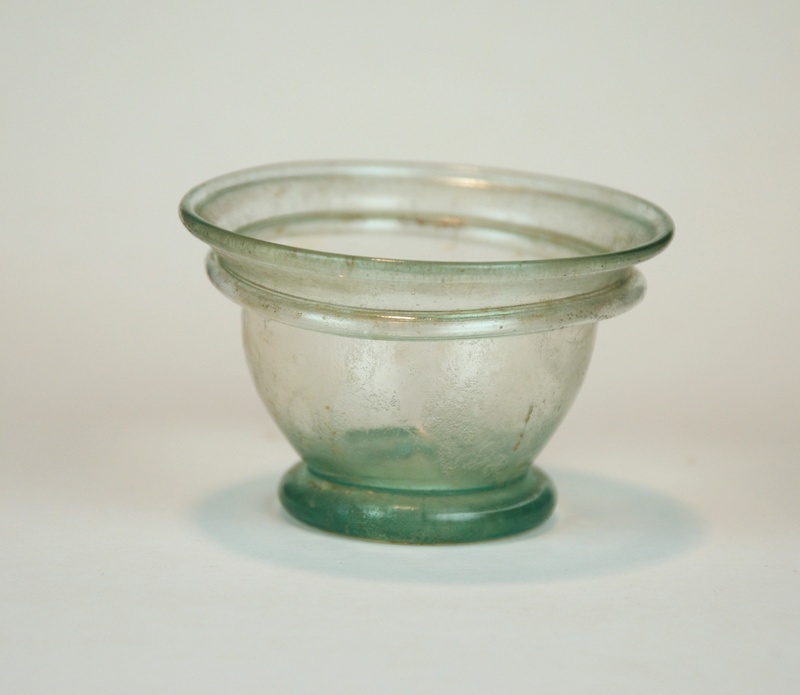 Description: Transparant clear glass with a tinge of blue; mouth slightly splaying; rim rounded; body narrowing at one quarter from the rim, widening towards the base; footring pinched in the centre of the concave bottom, visible from inside the glass. Condition: Complete, intact, unbroken,; slightly iridescent on the underside, weathered, with adhering sand. Remarks: A variation to the type called Carchesium, according to Sennequier. Provenance: From a private collection Krefeld, Germany, hence in a private collection in the Netherlands. Reference: Morin-Jean,1911, form: 98. Isings,1957, form 36b, p.50. Fremersdorf, Die Farblose Glaeser, p. 18, nr 46. Sennequier,1986, p. 48-49, nr. 14. Loeschcke: Slg. Niessen 52, nr: 871,Taf. 46. 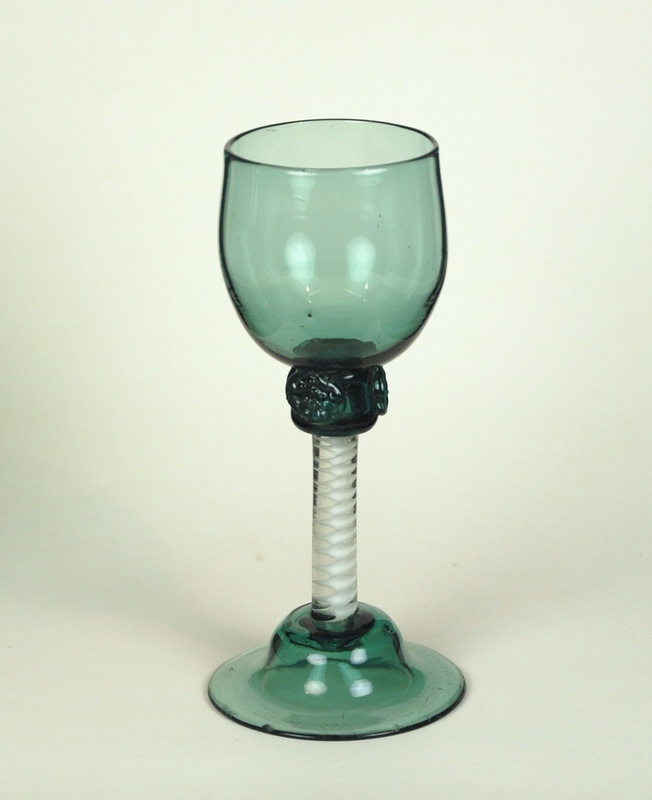 Description: Transparent pale green glass with handle of similar colored glass. Smooth transition to squat piriform body; rim widened and unworked; tall tubular neck; flattened base, slightly concave, no pontil mark. Angular ribbed handle with four narrow-set ribs, applied to lower neck, and attached to upper half of body; excess glass pulled down as a triangular tail, pressed against wall, and snapped off. Condition: Intact, slightly incrustation. At the base a bubble (fault) that popped at the moment the glass blower blew this jug and flattened the base. Perfect condition. 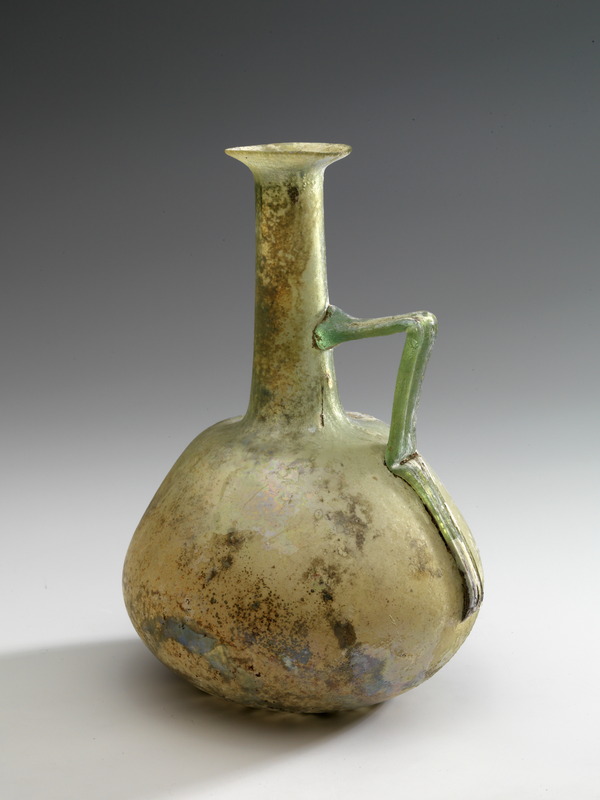 Remarks: Narrow-necked jugs are among the earliest vessels luxury glass tableware. The shapes echo contemporaneous pottery jugs. The body is usually piriform, squat bulbous, or spherical, the neck tubular, the rim everted or folded. The elegant handles are made with great care and precision and show a great deal of variety. This jug represents a small group that was often made in marbled and threaded glass and may have emanated from one workshop. The vessels are characterized by an angular tail decorates the lower end. The body can be piriform, squat bulbous, or spherical; the base is flattened. The find spots are concentrated in north Italy. Most jugs are large enough to have served as wine or water jugs at table. One magnificent jug of amber and white marbled glass came to light in the vicinity of Milan, at Dello, in the tomb of an athlete. The Augustan date assigned to the rich burial, based on coins of Augustus (27 BCE-14 CE), is probably too early, but the context is consistent with a date before the mid first century. A few ”imitations,” without the triangular tail at the lower end of the handle, were found in Cyprus.’ (Stern 2001). Another remarkable fact is the way in which the glass blower applied the handle. In later periods he will first apply the handle on the shoulder, then drawn up to attach it to rim or neck. This early jug shows the opposite way. First applying to the neck, then drawn down to attach to the body. 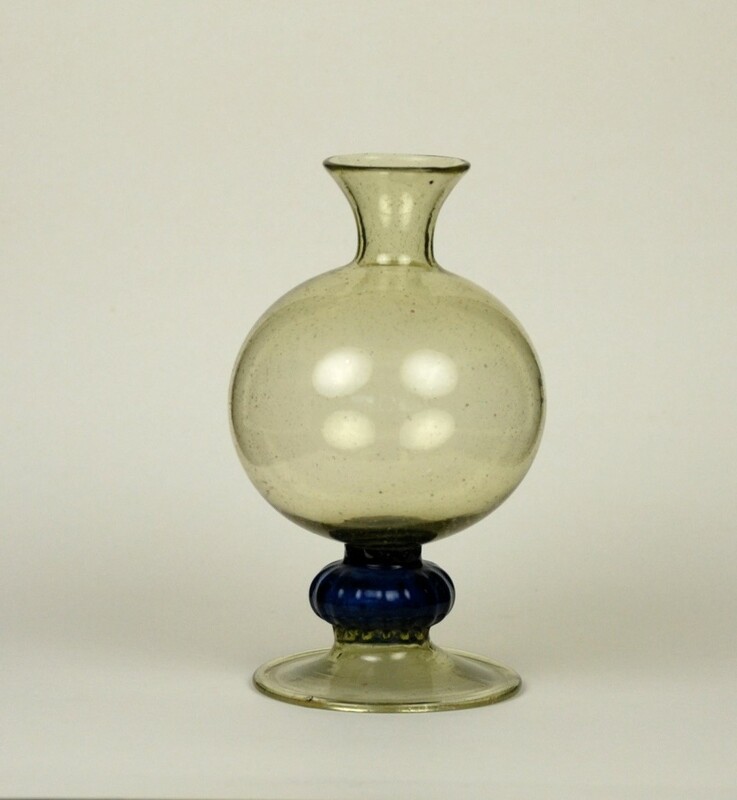 This spherical flask was blown from colorless glass. Around the body are several wheel-cut bands. The long tubular neck ends with a collared rim. The piece is intact and has a beautiful bluish green iridescence. The Metropolitan Museum of Art collection of medieval and Byzantine art is among the most comprehensive in the world. Displayed in both the Main Building at fifth Ave. and in the museum’s branch in northern Manhattan, The Cloisters museum and gardens, the collection encompasses the art of the Mediterranean and Europe from the fall of Rome in the fourth century to the beginning of the Renaissance in the early sixteenth century. It also includes pre-medieval European works of art created during the Bronze Age and early Iron Age. 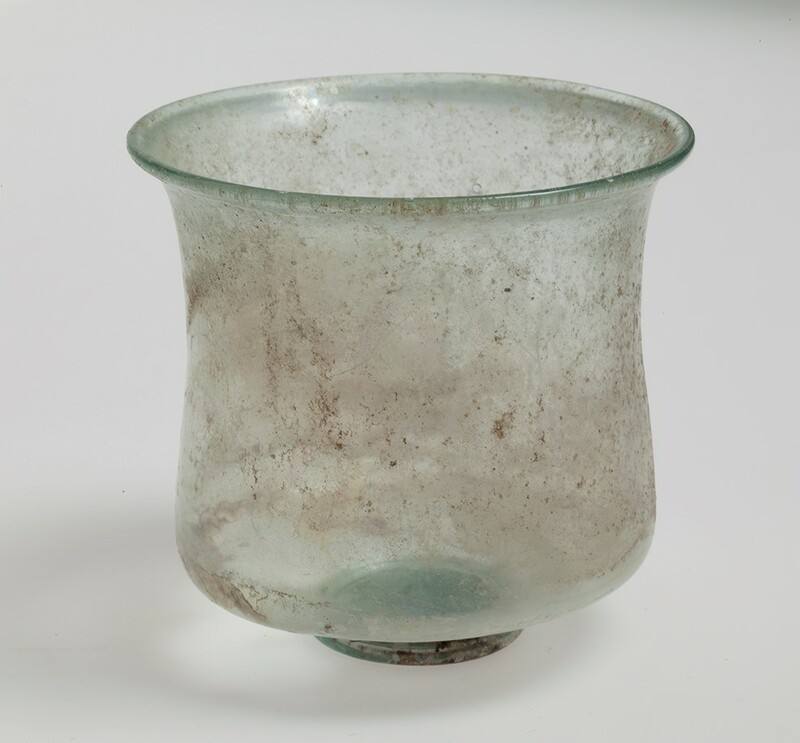 The medieval glass below is found in gallery 307 main building. 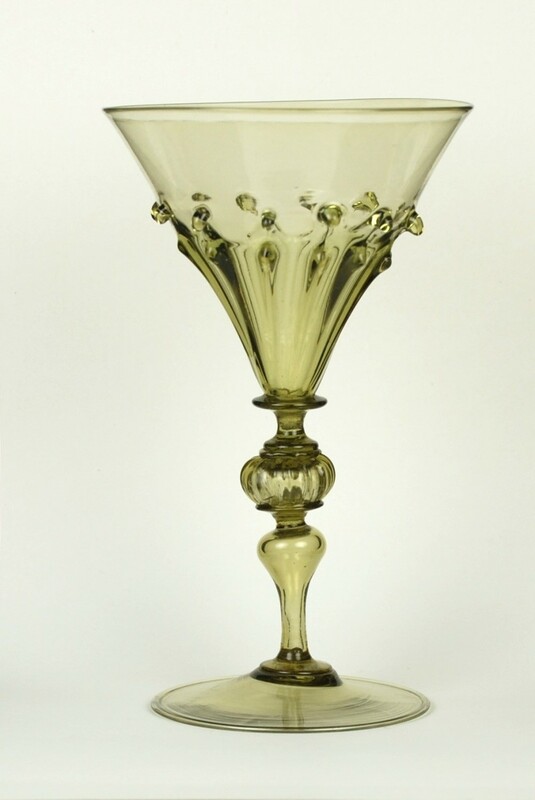 The Corning Museum of Glass defines a knop as: A component, usually bulbous, of the stem of a drinking glass, hollow or solid, used either singly or in groups, and placed contiguously or with intermediate spacing; also the finial at the center of a lid. For more information about knop styles see, An Illustrated Dictionary of Glass by Harold Newman, 1977 P.172. Below you will see a variety of knop styles from the Allaire Collection and a fine example from the collection of Elisabeth and Theo Zandbergen. 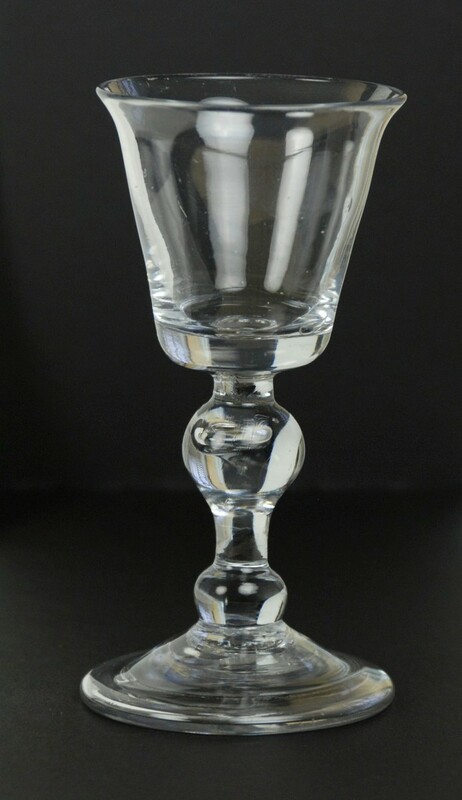 Facon de Venise Wine Glass from Elisabeth and Theo Zandbergen from northern Netherlands 17th Century. 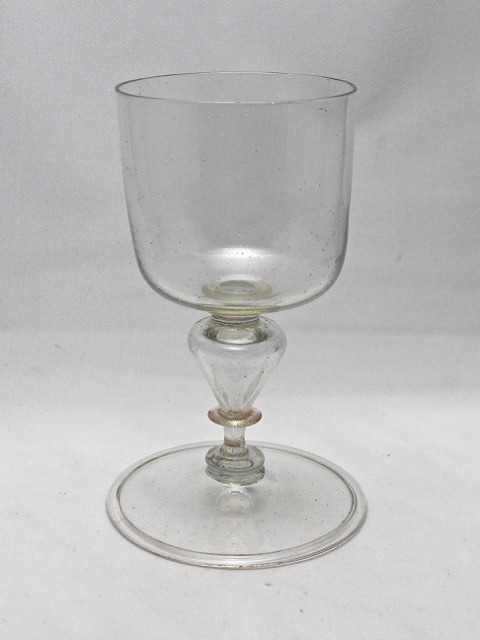 This fine wine glass has a so called rounded bucket bowl, see Bickerton, which is an almost cylindrical cup slightly, rounded of at the bottom. 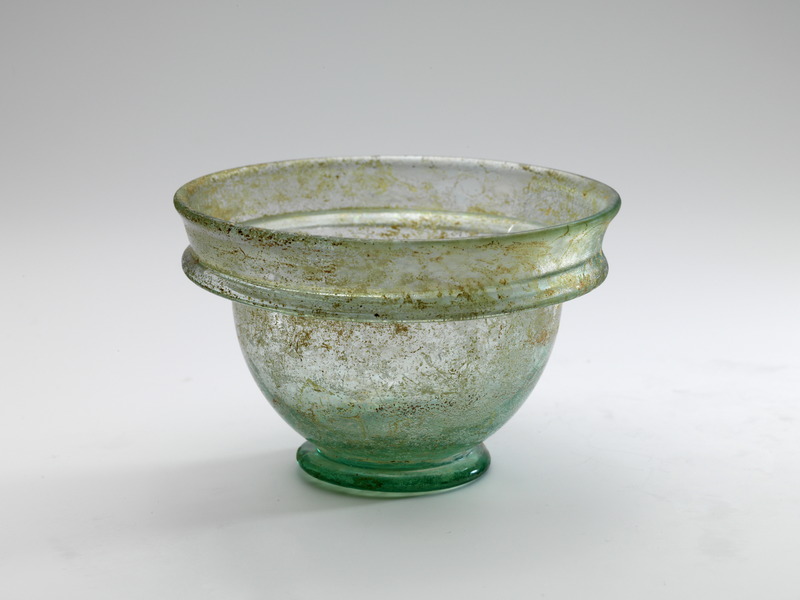 A bucket bowl is one of the rarer forms for this type of glass. 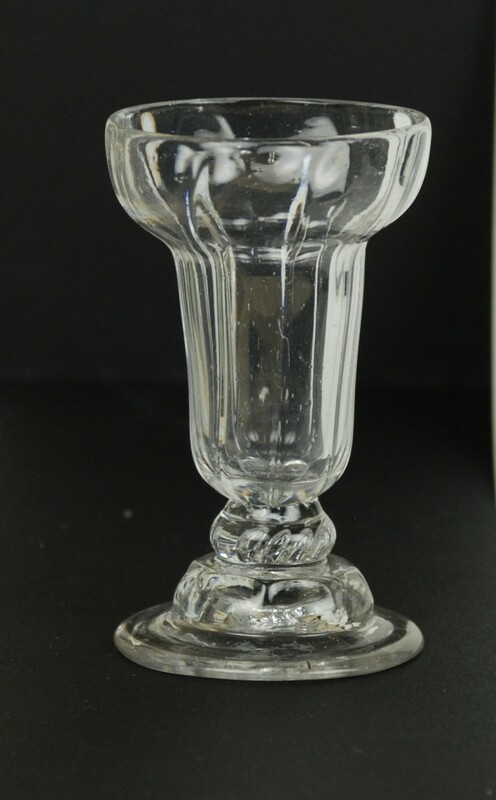 The very large diameter foot is also quite typical for glasses from this period see also the glass with the two hollow knops. The cup set directly on a merese which on a second smaller merese and then attached to the top part of the pointed hollow knop. At the bottom part of the knop is again a small merese, followed by a short solid section connecting thru a flattened knop to the almost flat foot with turned in rim. The stem construction is a so called inverted baluster. Late 3rd – mid 4th century AD. Rhineland, probably Cologne. L = 32.5 cm. H = 26.5 cm. D rim = 7.8 cm. Weight 175 gr. Classification: Morin-Jean 1913: Form 124. Isings 1957: Form 113. Goethert-Polaschek1977: Form 165. Technique: Free blown and tooled. Thread decoration applied. Description: Transparent pale green glass with turquoise and opaque white threads. Slightly averted mouth with thickened and rounded rim. The S-form body evenly tapering to the closed tip. At approx. 4 cm below the rim a horizontal opaque white thread is encircling the body. From there 7 turquoise and 10 opaque white threads run in a spiral downwards from upper left to lower right throughout the body to the tip. Upper part of threads unmarvered. 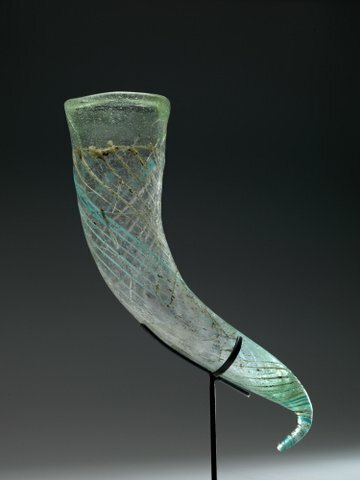 Remarks: Rhytons or drinking horns were made with either an open or closed tip. The drinker held the open-tip rhyton in his raised hand and poured the liquid into his mouth through the open tip. 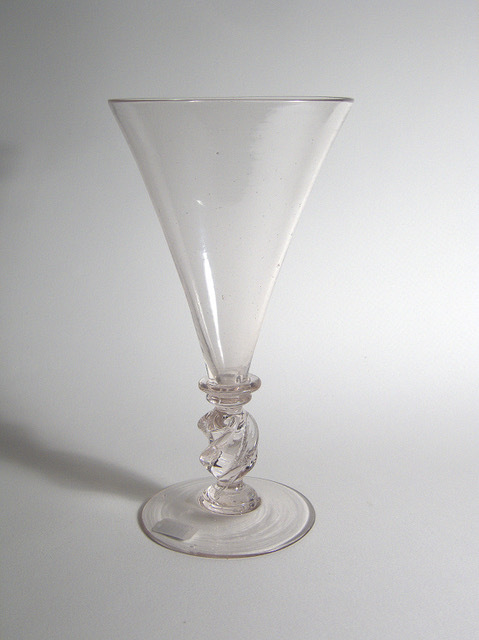 The closed-tip rhyton was used like a beaker. The latter way of pouring is shown on the Worringen beaker in the Toledo Museum of Art in an engraved scene wherein Bacchus pours wine from a rhyton like this one into a shallow bowl held by a partly draped woman, probably Venus. This type of rhyton is a typical Rhenish product. Most examples are in museum collections in Cologne, Trier, Bonn, Strasbourg, Worms and Mainz but were further spread into France, Scandinavia and the Baltic states. Very close parallels are in the collections of the Swedish Museum of National Antiquities (from a grave of a high ranked warrior in Östergötland) and of the Danish National Museum (from a grave of the “Woman from Himlingøje”). Provenance: Collection David and Jennifer Giles, London, UK., Collection W. Bastiaan Blok, Noordwijk, Netherlands. Published: Pierre Bergé Paris, 17 June 2010, No. 258D. References: Corning Museum of Glass, Accession number 2004.1.13. Fremersdorf 1984, Rheinisches Landesmuseum Bonn, No. 265. Fremersdorf 1962, Römisch-Germanisches Museum Köln, Tafel 92. Fremersdorf 1961, Rheinisches Landesmuseum Bonn, Tafel 42 – 43. Follmann-Schulz 1992, Rheinisches Landesmuseum Bonn, Nos. 34 – 35. Goethert-Polaschek 1977, Rheinisches Landesmuseum Trier, No. 1542. This is a process of applying hot trails of glass onto the body of a vessel for decoration, to form a handle or to create a foot. A very thin trail is called a thread and thick trails are coils. Trails can be a contrasting color or the same color as the object. The technique started in the ancient period and is still used today. 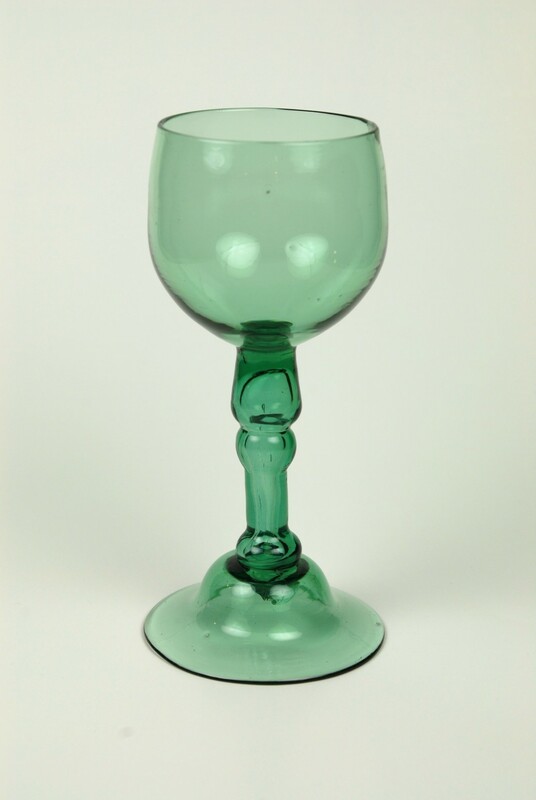 The following examples from the Allaire Collection illustrate glass objects with trailing. Click on the photo to enlarge. Second half of the 3rd. century A.D. Cologne or Rhineland. Isings : form 100A . H: 19.8 cm D- body: 7.6 cm D-mouth: 2.4 cm. Technique : Blown into a cylindrical mold; body sloping slightly inwards; cylindrical neck; knocked-off rim, rounded; shoulder slightly sloping; in mold blown standing ring with central concave part; no pontil mark; wheel-cut lines. 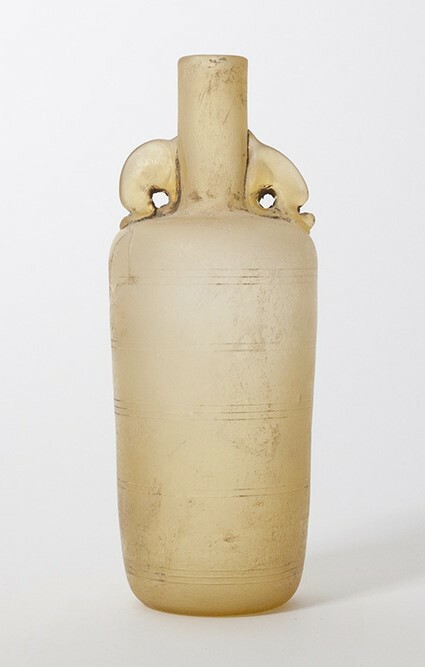 Description : Roman bottle with dolphin handles of semi-translucent light yellow colored glass almost opalescent; handles applied with central holes close to the neck and shoulder: five bands of wheel-cut lines divided into pairs of 3-2-3-2-3, from shoulder to base. Condition : Unrestored and complete, with circular crack on the body near the shoulder, the four parts, big and small, in place and stable; traces of wear all over body and base; almost no iridescence; isolated small bubbles. Remarks: Said to have been found in the province of Limburg, the Netherlands. Most likely produced in Cologne or Rhineland. The dolphin-shaped handles are of a strongly shaped abstract form indicating a date in the second half of the 3rd. century A.D. Several examples in the same size from Cologne (RGM), Germany, Nijmegen (Museum Het Valkhof) and Leiden (MvOL), the Netherlands. About the color, Kisa (1906) in general speaks of: ‘Wachsgelb’ or ‘Buttergelb’ (wax-yellow or butter-yellow.) indicating the use of semi-opaque yellow, also in connection to ‘Schlangenfadenglass’ (snake thread glass). Provenance : From a private dutch collection. Reference: Kisa 1906: Formentafel C 158; Morin-Jean 1913: forme 10A; Isings : form 100A , Boeselager 2012: form 54. Literature: Niessen 1911, 40 no. 399, pl 33; Doppelfeld 1966, 46-7 pl. 63; Fremersdorf and Polonyi 1984, 92, no 204. 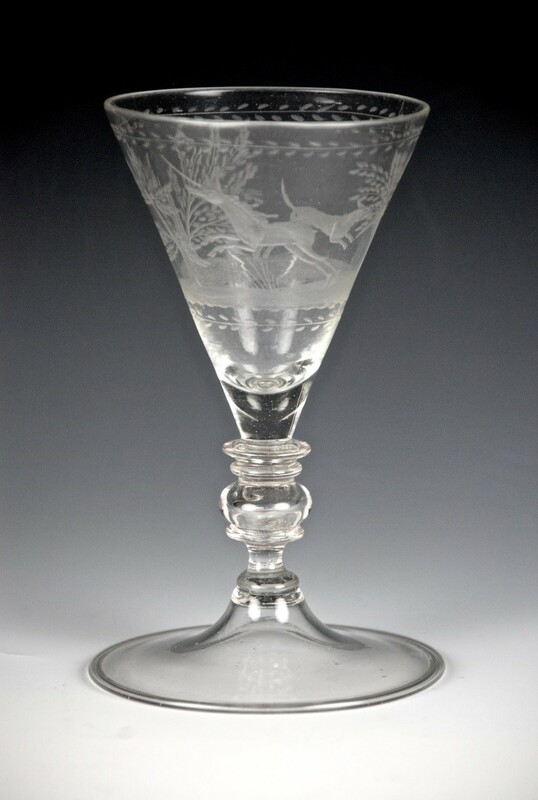 D. Whitehouse: Glass of the Ceasars, no 111., from the collection of RGM, p 202. D. Von Boeselager, Koelner Jahrbuch 45, 2012, p 7-526. 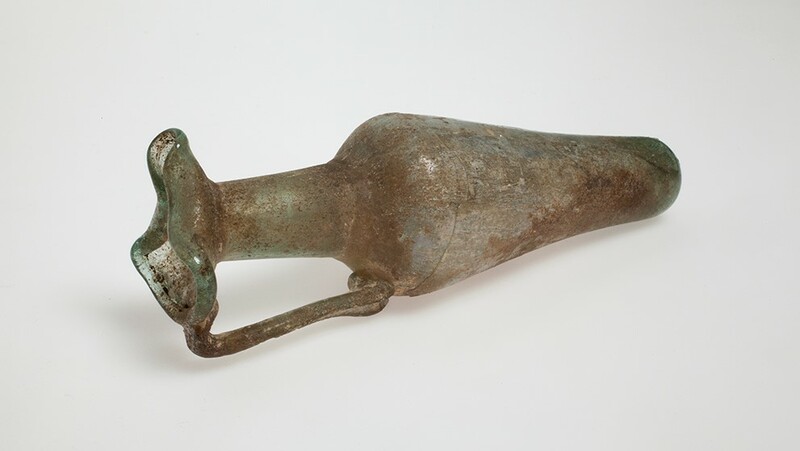 Link to a similar bottle: ROMAN GLASS BOTTLE WITH DOLPHIN HANDLES called “SPEYER BOTTLE”. 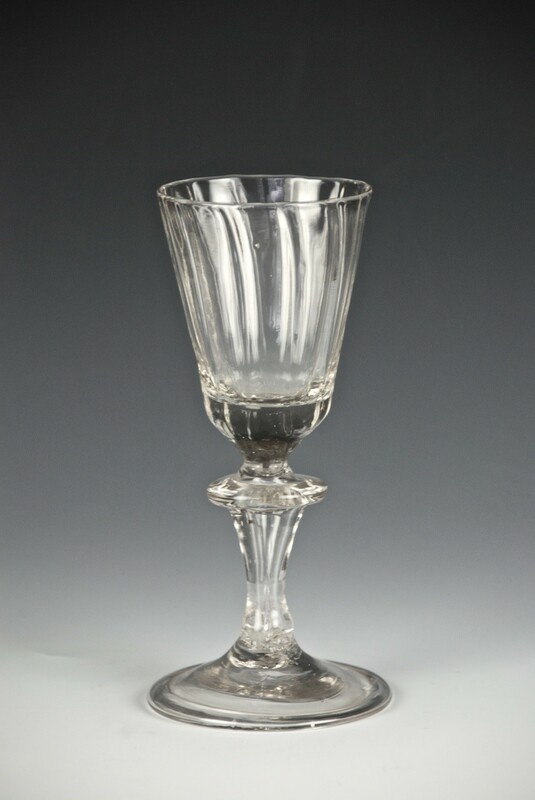 Technique: Free blown body; mouth out-splayed and pinched to form trefoil; rounded rim; handle drawn up from shoulder to the rim, small amount of excess glass drawn back and pushed under the rim. Condition: Broken and repaired with some small proportion missing. Remarks: ‘Pitchers of this kind appear to be scarce’, according to M. Stern. ‘The form does not occur among palestinian finds, therefore probably Syrian.’ This jug however is said to have been found in or near the oppidum of Noviomagus, Nijmegen, the Netherlands. Provenance: From a private dutch collection. Parallels: Fondation Custodia Paris, inv. 4101. British Museum: inv. 1911/4.4/8 from Aleppo. RGZ Mainz inv. 0.6676.